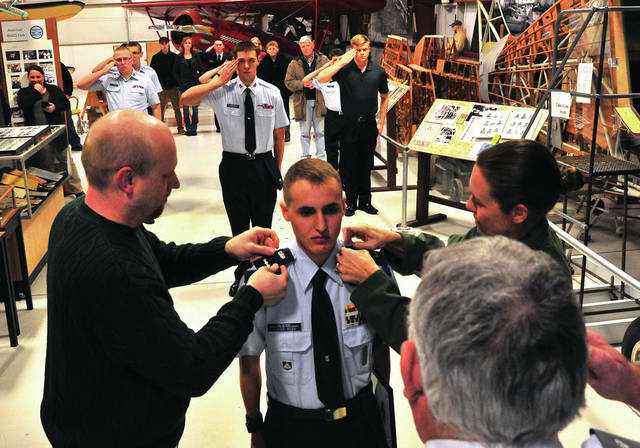 Mike Ullery | Troy Daily News Newly promoted Civil Air Patrol Cadet Captain Max Foster-Webb is pinned with his new insignia by his dad, Paul Webb, and Lt. Col Monyca Uecker, USAF, during ceremonies at the WACO Museum and Aviation Learning Center last week. Foster-Webb, 17, from Springfield, was awarded the Civil Air Patrol’s Amelia Earhart Award in addition to the promotion. TROY — As a member of the Civil Air Patrol’s cadet program, one teen shared how the program has made a positive impact on his life. Max Foster-Webb, 17, of Springfield, received the Civil Air Patrol’s Amelia Earhart award for completing Phase III of the cadet program on Nov. 27. With the award, Foster-Webb was promoted to the grade of cadet captain and is eligible to represent the United States in the International Air Cadet Exchange. The award recognizes four areas of excellence that Cadet Capt. Foster-Webb achieved including leadership, aerospace, fitness tests and character. Earhart award winners must pass comprehensive exams in leadership and aerospace topics. Foster-Webb has been part of the Civil Air Patrol Squadron 706 for five years. The squadron meets weekly at the WACO Historical Society’s Museum. Foster-Webb said he joined the CAP to make friends and learn more about the aviation field. Foster-Webb said his participation in the cadet program has taken him far in life. Foster-Webb is a freshman at Sinclair State Community College and is studying fire science and EMS. Lt. Col. Monyca Uecker challenged Foster-Webb to earn the next coveted award called the Spaatz award, which is the CAP’s highest cadet honor. “It’s a goal of mine to achieve the next award, the Spaatz award. I wanted to win the Earhart award because my cousin achieved it and he aged out so it’s a goal of mine to go the next level,” he said. Uecker explained there are three awards cadets in the Civil Air Patrol can achieve, the first is the Mitchell, the second Amelia Earhart and the third is the prestigious Spaatz award. The Civil Air Patrol is an auxiliary of the United States Air Force. The CAP, made of civilian volunteers, has four goals including the cadet program, homeland security, aerospace education and emergency services. The Cadet program is led by Commander Capt. Seth Nottingham and Lt. Robert Schwartz, deputy Commander. Squadron 706 meets each Tuesday at WACO Historical Society’s Air Museum in Troy. The cadet program is for anyone ages 12- 21 years old. https://www.urbanacitizen.com/wp-content/uploads/sites/36/2018/12/web1_112718mju_waco_cap.jpgMike Ullery | Troy Daily News Newly promoted Civil Air Patrol Cadet Captain Max Foster-Webb is pinned with his new insignia by his dad, Paul Webb, and Lt. Col Monyca Uecker, USAF, during ceremonies at the WACO Museum and Aviation Learning Center last week. Foster-Webb, 17, from Springfield, was awarded the Civil Air Patrol’s Amelia Earhart Award in addition to the promotion.